I first heard about this Springfield GI45 at the range. It had been owned by a blowhard who shot it very little before he sold it. I tracked it down at a pawn shop and purchased it for $350. I was not, at first very interested, but at $350, it was good trade fodder. I could shoot it a bit and trade it off, or keep it as a beater gun. I might even drop it off at Clark's for a meltdown. For the money, it was a deal that would be hard to lose on. Still, it was an unispiring utilitarian pistol. Then, one afternoon, I screwed some sambar stag grips onto the stainless gun. 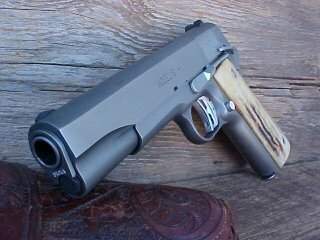 The pistol immediately became reminiscent of the GI 1911s that one often saw decades ago, nickeled and wearing stags. Suddenly, the pistol interested me. The stag grips I had screwed to the pistol were cut for an ambi-safety, and would look bad without one. I began to make a list for Brownell's. I ordered one Ed Brown ambi-safety, a stainless steel wide spur hammer, and a flat mainspring housing. I already had a Dlask trigger in my parts box. The Dlask trigger has a magnesium shoe and titanium stirrup, and is fully adjustable. It normally sells for $45 or so, but I got this one for a steal on ebay. The lightweight trigger is only part of a trigger job though. I cut the hammer hooks to .020, and polished all the lockwork. I installed a Nowlin sear spring, and I placed a 19 pound spring into the flat mainspring housing. The barrel that comes in the Springfield Mil-Spec and the GI45 is a two piece barrel made by Storm Lake. It is not a bad barrel, but my Springfield Mil-Spec benefitted greatly from a fitted bushing, so I installed an Ed Brown fitted bushing in the muzzle of the stainless GI45. 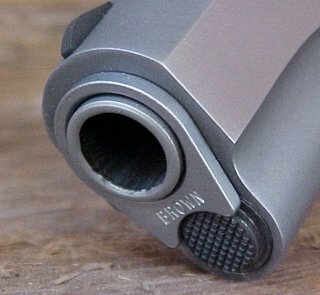 By tightening the barrel in the slide, I hope for increased accuracy. Although the pistol was reliable, it's accuracy was pretty grim. If the bushing and trigger job do not improve the accuracy sufficiently, I may consider a Kart or BarSto barrel. I smoothed out the sandblasted rounds on the pistol using scotchbrite and 400 grit sandpaper. I am one of those people who prefer the feel of a smooth gun. The resulting 1911 is reminescent of a bygone era, when custom 1911s were crafted, not bought. I can hardly wait to get to the range and try it out. Need a recommendation, if you don't mind... My father managed to crack the barrel bushing of my WWI-military issue 1911. 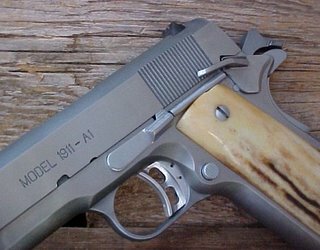 What would you suggest for a replacement that's in keeping with the original 1911 style but will last so my son can shoot it, too? Sambar grips look good! She's slicking up real nice. 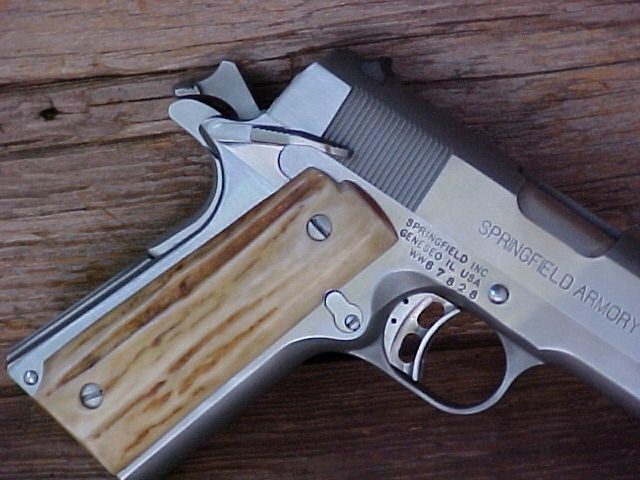 Good looking 1911 Springfield. Love thos grips with the stainless. Seeing something like that really motivates me too. Nice retro GI45 Xavier, love those grips. Man, am I seeing hammer bite on the web of my hand . . . .
Anon, all 1911 triggers will have some wiggle if they have enough tolerance to work properly. The channel they fit in inside the trigger guard allows for that. The Dlask can be fitted with less than most, as can the McCormick, but some play will still be there. Or you will have a stiff, sticky trigger.